and commissioned paintings in watercolours, acrylics and oils. Bob will be organising holidays to the Yorkshire Dales and Cardigan for 2019. For more information go to the Holidays page! 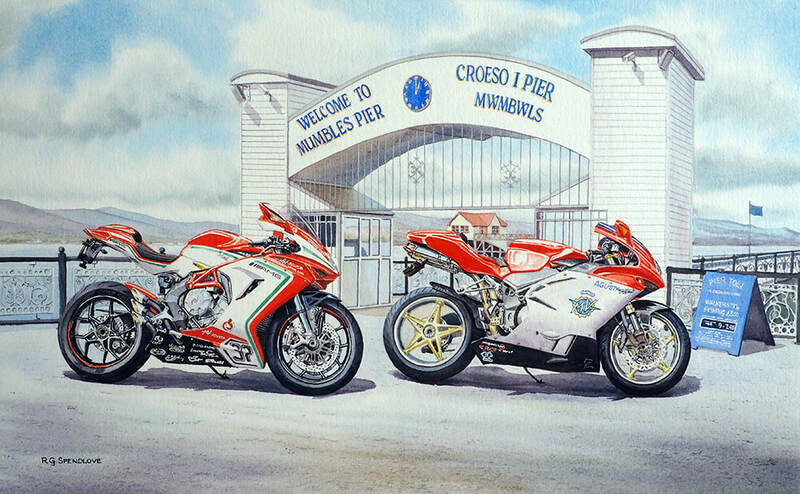 Bob's latest commission painting features an MV Agusta F4 1000 and an MV Agusta Reparto at Mwmbwls Pier in South Wales. These vibrant motorbikes are nicely balanced by the soft, distant landscape. Bob paints a wide variety of commission pieces, including vehicles, houses, landscapes and monuments. If you're interested in having your own personalised original painting visit the Commissions page for more details. Get Bob's artwork on your wall! There are a large range of prints on Bob's official shop, including landscapes, motorbikes and cars in all shapes and sizes. Simply follow the Shop link to see the full range.